How to recover apple id password ? with 4uKey – Password Manager. Have you ever forgotten a password? I know many of you have and I have myself forgotten many many passwords including Wi-Fi passwords, website logins and even apple ID or iCloud passwords. Today i’m sharing with you a software that will help you to recover those passwords believe it or not. I was so surprised to find out so many passwords. How well this software works. This software is very similar to the Elcomsoft Phone Breaker. 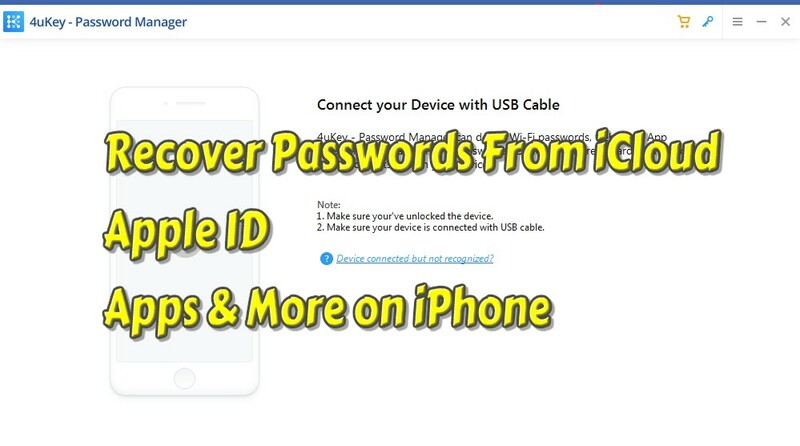 This can find for you all stored password on your iPhone, ipad or ipod. Your iphone needs to be Activated and Unlocked. if you want to try it out you can download the trial version. NOTE: This will not work on an icloud locked device. Recover Passwords From iCloud, Apple ID, Websites, Apps web logins, wifi hotspots on iPhone – with 4uKey – Password Manager. how many times have you forgotten the password? Connect the device and click on scan, once you connect your device in the scanning, now wait until the software finish all files. If you have a lot of data and passwords to recover it can take some time. if you have less it’ll take less if you have more it’ll take more time to scan and recover those passwords. I was so shocked and if you try this software you going to be impressed as well , look at this video to understand how this software works. All Wi-Fi passwords that you´ve logged in in the past, of course, you will see on the software many passwords for websites and other applications passwords, also email passwords. Also any credit card credentials used on the iPhone as you can see on this video. At the very very end of this software categories you see one Apple ID password it was recovered with this software. I was really really surprised. If you want to Recover Apple id password, this is one of the software you should try. I highly recommend it if you’ve forgotten your passwords, Wi-Fi any website any app or even your Apple ID this is a really easy way to recover iOS passwords. Download 4uKey – Password Manager All iOS Password Solutions makes it easy for you to find, recover, view, export and manage all your passwords on iPhone and iPad.